“Leaves of three? Let them be.” This rhyme helps identify poison ivy. If you miss the signs and get a rash, there’s another plant you need to know: jewelweed. Jewelweed is native to the Eastern and Midwestern United States and is often found growing conveniently near poison ivy. 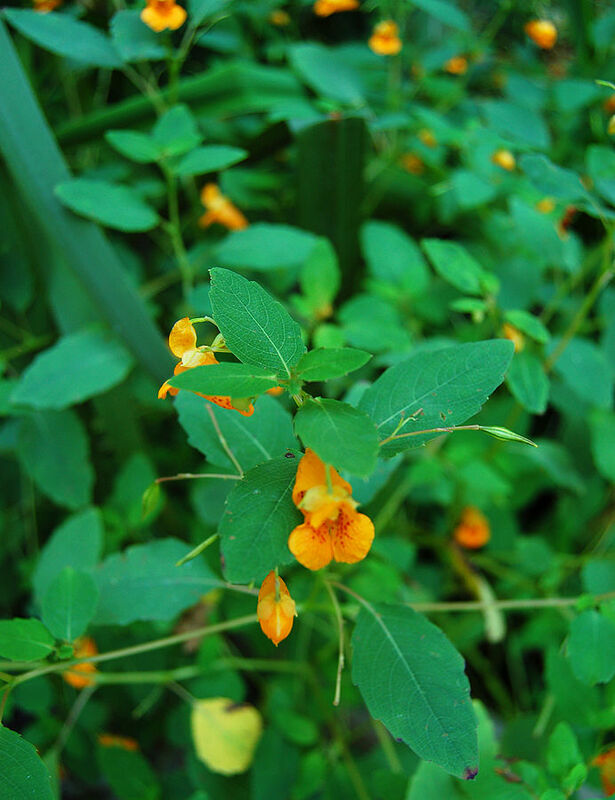 Small, orange (or sometimes pale yellow) orchid-like flowers make jewelweed easy to spot. Some say the jewelweed name comes from how water beads up on the leaves like shiny gems. Others say the name comes from the blue seeds that forcefully shoot from the hanging pod with only the lightest touch. This feature points to another name for this plant: “touch me not.” Despite this name, the touch of jewelweed can be very soothing. Native American tribes were well acquainted with jewelweed’s ability to treat a poison ivy rash. 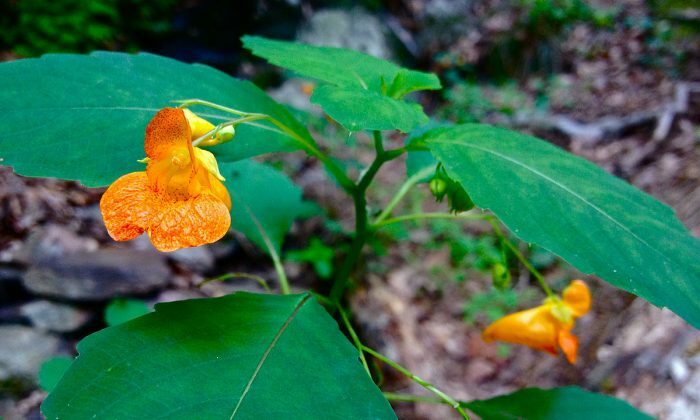 Although herbal folk remedies are often dismissed by modern science, many still swear by jewelweed’s power, including the National Park service. In 1922, Dr. H.W. Felter wrote that fresh jewelweed applied to poison ivy dermatitis provides relief that is “almost magical.” A study published in 1958 in the “Annals of Allerty” found jewelweed effective in treating poison ivy rash in 108 of 115 patients. One of the chemicals found in jewelweed sap is called lawsone. Think of lawsone as the antidote to urushiol, the rash-inducing oil found in poison ivy, poison oak, and poison sumac. According to Dr. James Duke’s 1993 book, “The Green Pharmacy,” lawsone competes for the same receptor sites in the skin as urushiol. “If applied quickly after contact with a poison plant, lawsone beats the urushiol to those sites, in effect locking it out,” he writes. According to Duke, the highest concentrations of lawsone are found in the “red protuberances” where the stalk meets the roots. Jewelweed thrives in a humid summer with lots of rain. It’s a delicate and very juicy plant that can grow from two feet to over five feet high by the end of the season. Once cooler, drier weather rolls in, jewelweed dies off, and saving any is a challenge. Some herbs concentrate their medicinal constituents when dried, but dry jewelweed is pretty worthless. The best time to use jewelweed is picked fresh on the trail. Once you can correctly identify the plant, simply break a stem and rub the juice on bare skin to prevent against or after contact with poison ivy. Jewelweed also helps soothe the sting of nettles, bug bites, hives, or any red, itchy rash. One common way to preserve jewelweed’s power is by throwing several small plants in a blender with a tiny bit of water. Once blended to a mash, filter out the pulp, pour the liquid into ice cube trays, and freeze for future use. Collect plants early in the summer before they get too big and tough to process. Fresh jewelweed juice can be made into soap and salves to treat various skin conditions. 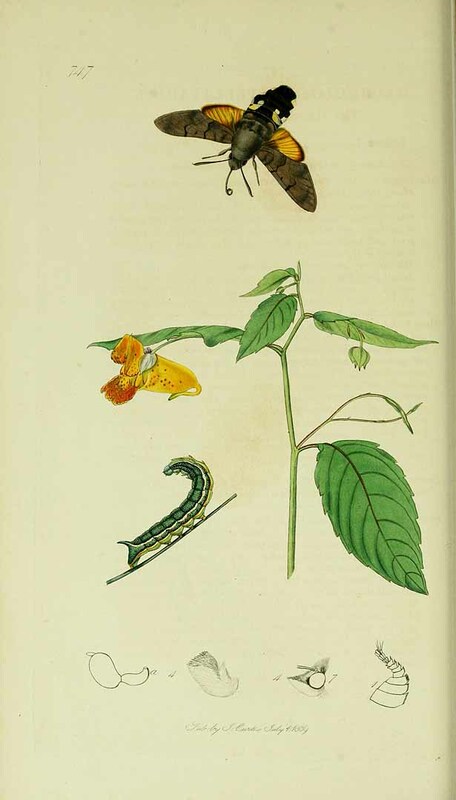 However, some jewelweed preparations can be problematic. While fresh jewelweed has been shown to be effective against poison ivy, a 1997 study found that jewelweed extract was no more effective than distilled water. American naturalist Euell Gibbons discouraged use of jewelweed tincture, citing a propensity for mold and allergic reactions. There have been several reports of severe skin irritation using an alcohol-based jewelweed extract. Jewelweed is primarily a topical remedy, but it has been used for food and internal medicine. 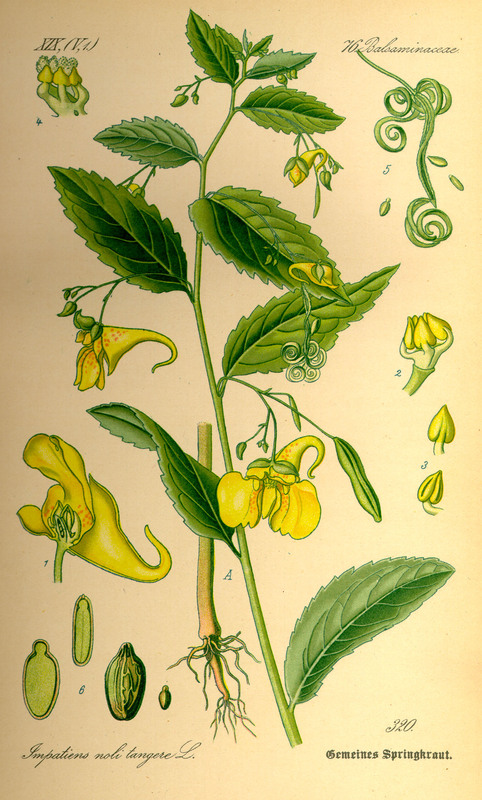 Several Native American tribes used jewelweed tea for stomach cramps, water retention, and digestive upset, but some find the orange tea too nauseating to drink. Many modern herbalists discourage internal use. Deer have been known to eat jewelweed, but for human food the best bet is the seed. Jewelweed’s seed is small, and its trigger-sensitive, fire-in-all-directions, projectile mechanism makes it difficult to collect. Determined foragers are rewarded with a pleasant walnut-like flavor. Young jewelweed shoots can be cooked like green beans, according to Euell Gibbons. Jewelweed is very high in selenium—a mineral found mostly in seafood, organ meats, and Brazil nuts that is often lacking for those with low thyroid function. Some warn that consuming too much jewelweed may result in selenium poisoning. Another reason to go light on your jewelweed consumption is that the plant is very high in calcium oxalate—a mineral which is often responsible for kidney stones. Those with a history of gout, arthritis, or kidney problems should avoid eating jewelweed. Jewelweed is an old remedy for hemorrhoids. It contains an anti-inflammatory, antifungal chemical called 2-methoxy-1, 4-napthoquinine which is the active ingredient in Preparation H. Jewelweed can also used be for topical fungal infections such as ringworm, and athletes’ foot. Jewelweed is a member of the impatiens family of plants. Some claim that other varieties of impatiens have similar skin soothing attributes, but are just not as strong as jewelweed. Studies have found that jewelweed contains anti-cancer compounds, including the 5-alpha-reductase inhibitor, impatienol, which may inhibit prostate and breast cancer. The Ojibwa Indians spread fresh jewelweed juice on their foreheads to soothe headaches. The Creek Indians bathed in a tea of jewelweed and spicebush berries to treat congestive heart failure. A 2012 study in the Journal of Ethnopharmacology found jewelweed to be effective at getting rid of poison ivy’s urushiol, but not as effective as Dawn dish soap. However, researchers believe that soapy chemicals known as saponins may contribute to jewelweed’s rash-cooling magic. Jewelweed flowers are a favorite of bees and hummingbirds. Hiking can be a fun way to incorporate being outside into a normal workout routine.